PT-305’s original flags. 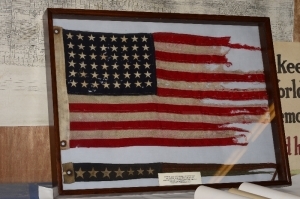 In the frame, the battle flag is pictured above while the commissioning flag lies below it. The Museum’s PT-305 restoration project recently received a valuable piece of the boat’s history this past September when the boat’s original flags were returned to the vessel. The flags were donated by Mitch Cirlot, the son of one of the original crew members on PT-305, Joseph Cirlot. Mitch’s dad, Joseph, was the longest serving sailor on PT-305. According to Mitch, how his father ended up with the flags is because he was the last one to rotate off the boat. 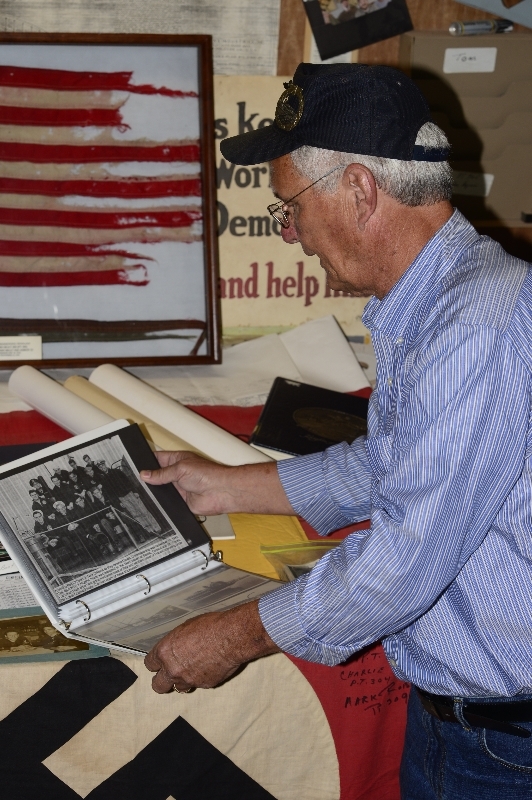 Joseph’s skipper asked him to take the battle flag and the commissioning flag home with him. 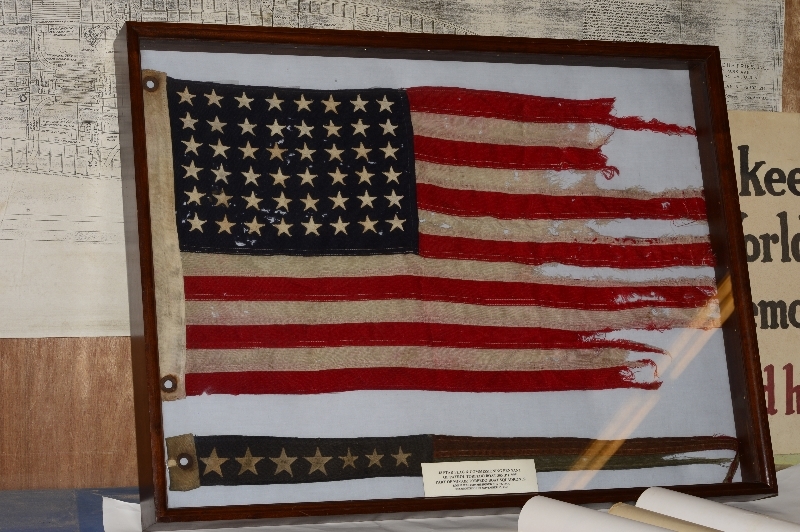 He was also given the captured Nazi flag containing the signatures of the PT boat squadron sailors. 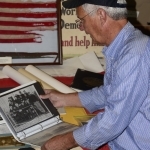 With the donation of these flags, Mitch also gave a photograph of his father’s wife Marion Cirlot that was affixed to Joseph’s bunk within PT-305 during the war. 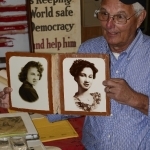 Our restoration crew will be placing this photograph back in Joseph’s bunk just as it was nearly 70 years ago during World War II. 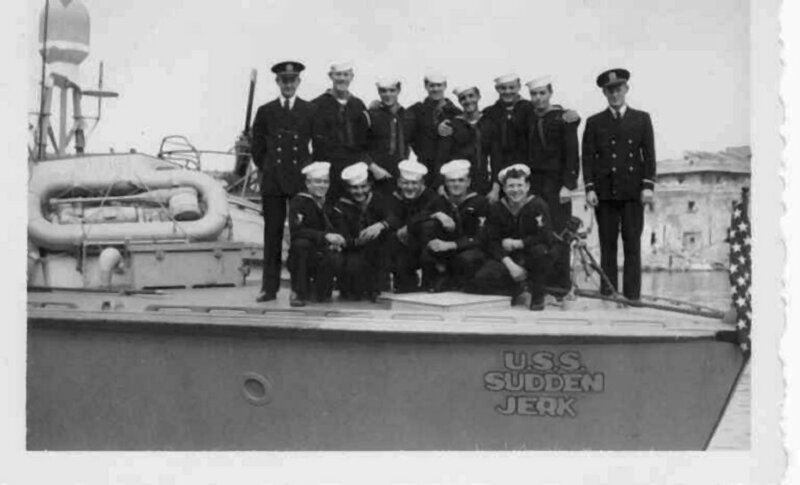 We would like to reach out to the families of PT-305 and obtain photos of the crew’s sweethearts, wives, and family that would have likely attached to the bunk. If you have anything to share with our restoration crew about PT-305, please contact us here. 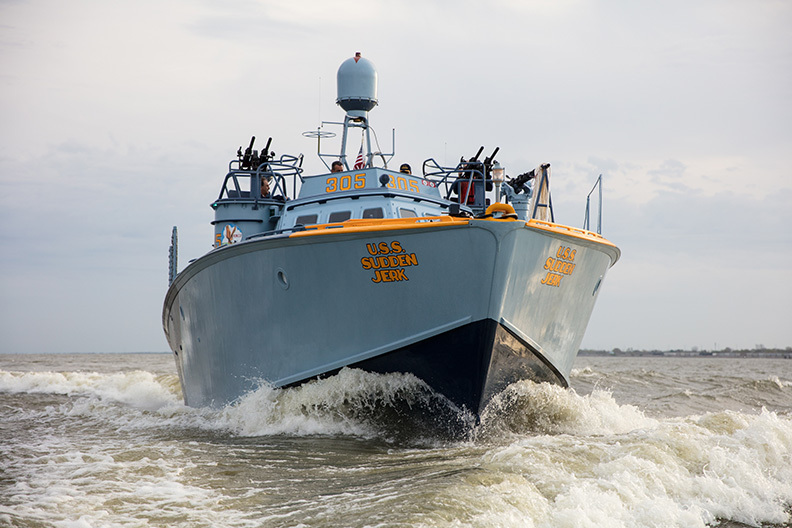 To learn more about the PT-305 and stay up to date with her progress, subscribe to our Friends of PT-305 Newsletter. 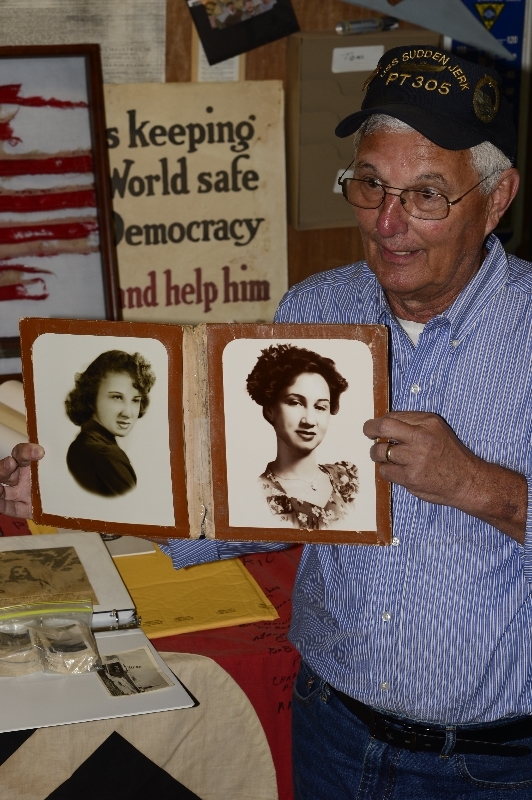 Mitch Cirlot holds a photo of Joseph Cirlot's wife Marion. 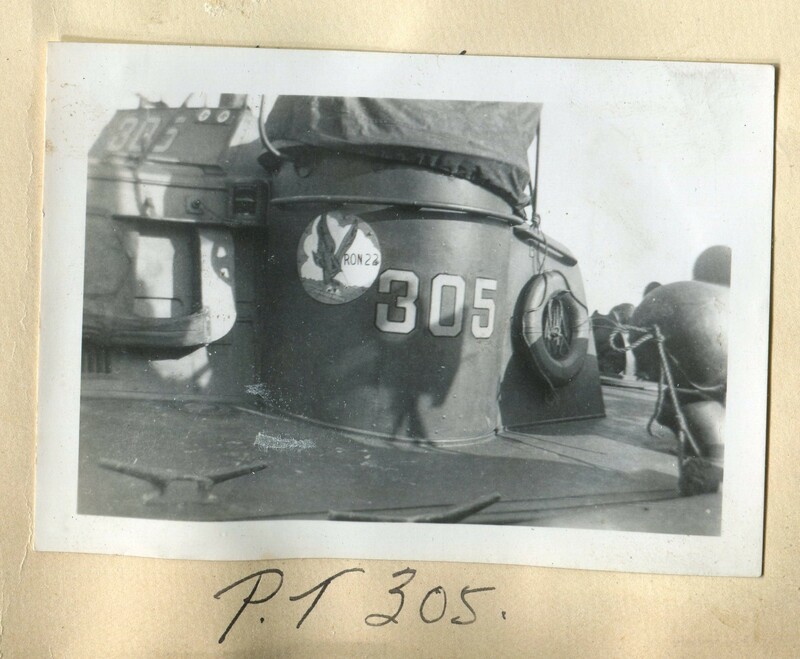 Mitch Cirlot also donated photos, mementos, a coffee cup and a sugar dispenser from PT-305. PT-305 being loaded for transport in Norfolk, Virginia. Courtesy of 305 crew member Jim Nerison. The squadron spent about three months in Miami, Florida for shake down and training. The training included all aspects for which the boats were designed: torpedo firing, gunnery practice, speed trials and boat handling maneuvers. In preparation for over-seas duty the boats were dry-docked, freshly painted, and all systems were checked out thoroughly. To avoid the rough water off of Cape Hatteras, we once again took the intracoastal waterways north to Norfolk. 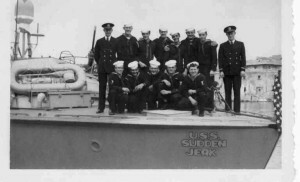 PT 305 and three other boats were placed in cradles on the deck of a navy tanker. The tanker joined a large convoy of other ships for an Atlantic crossing; then through the Straits of Gibraltar and into the Mediterranean Sea. The tanker anchored in the harbor at Oran, Algeria on the north shore of Africa. 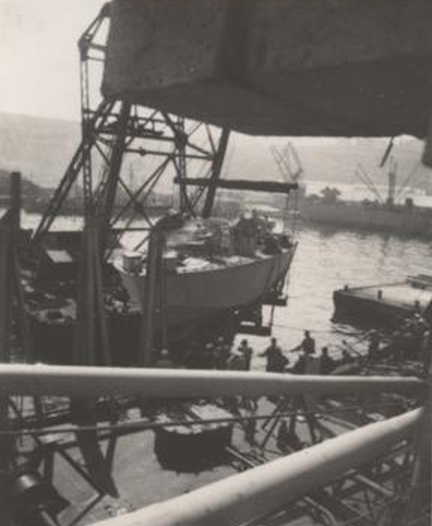 There was only one crane in Oran with the capability to pick up a 70+-ton PT boat so we had to wait two weeks to be off loaded into the water. We took the boats from Oran, stopped in Algiers to re-fuel, and then on to Bizerte in Tunisia. 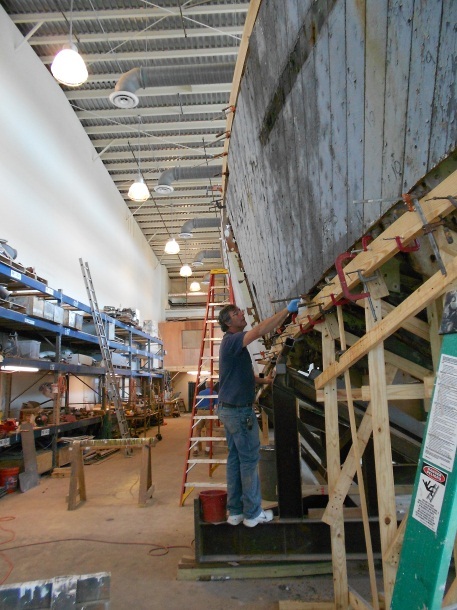 Click here to learn more about PT-305 and her restoration here at The National WWII Museum. Seventy years ago, on 10 November 1943, in New Orleans Motor Torpedo Squadron (Ron22) was commissioned in New Orleans. 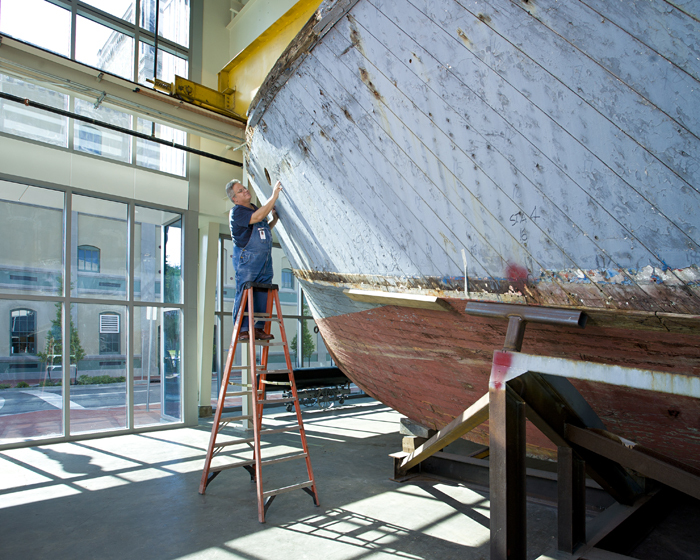 Utilizing staff, volunteers and outside contractors, the Museum has undertaken a substantial number of restoration projects since opening in 2000. Restorations include several airplanes, two boats, three armored vehicles and numerous other vehicles and artillery pieces. 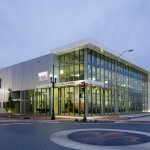 Director of Collections and Exhibits, Tom Czekanski, will share the unique story of each of these pieces – complete with challenges and triumphs. 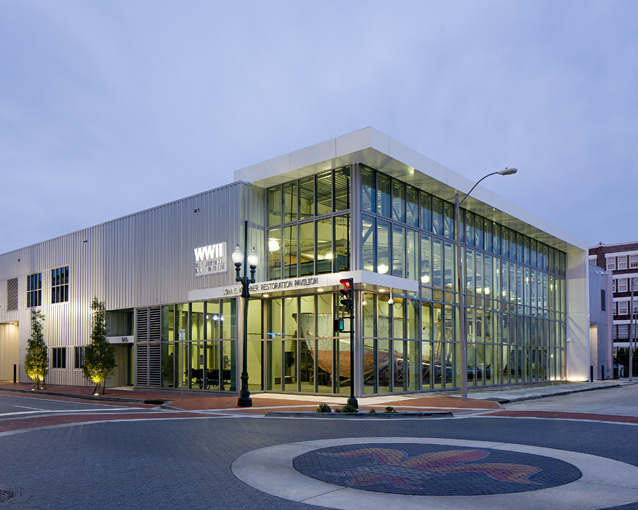 Dinner with a Curator is a seasonal series where Museum staff and guests discuss a featured topic related to World War II while enjoying a delicious three-course dinner. All dinners catered by Chef John Besh at the Museum’s American Sector restaurant. Space is limited. Reservations are required. 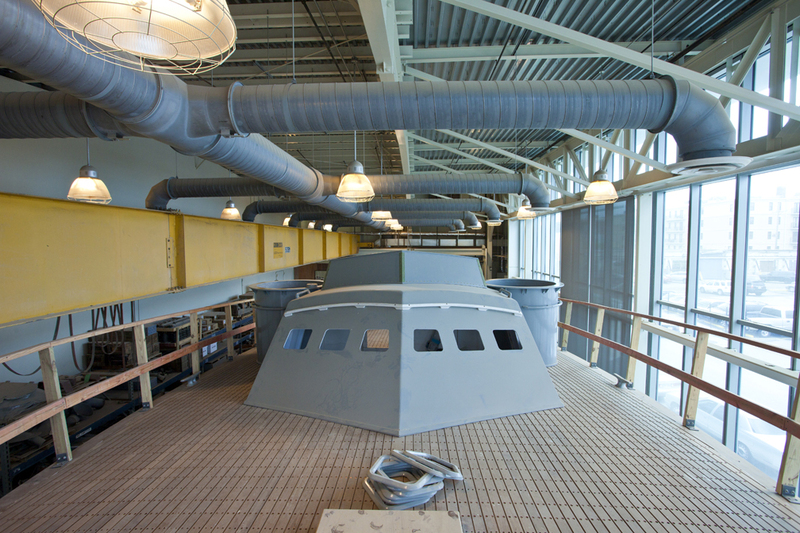 The John E. Kushner Restoration Pavilion at The National WWII Museum is home to the PT-305 Restoration Project. 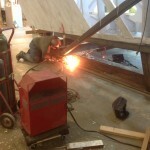 It’s a busy week in the John E. Kushner Restoration Pavilion. 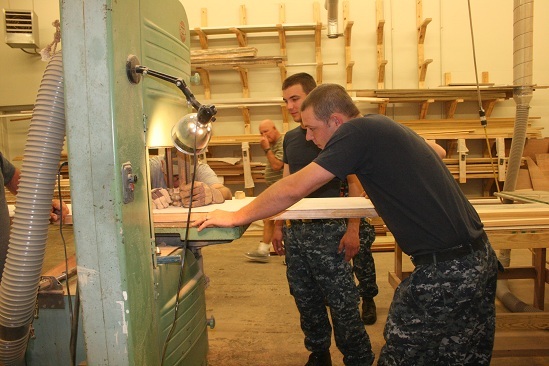 Today volunteers made surgical cuts to the cradle that is currently supporting the WWII-era PT boat. 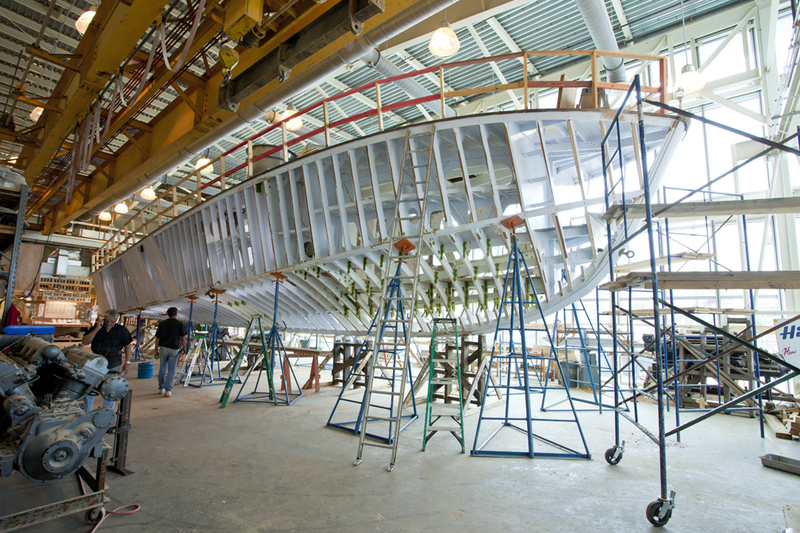 Later this week, PT-305 will be raised 30″ to allow the crew better access to the hull for the planking process and the current cradle will be dismantled. We hope to have more updates for you soon on this process. 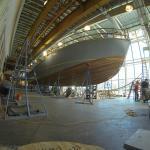 Meanwhile, learn more about the history of PT-305 and the renovation process. 70 years ago: Keel laid for PT-305! 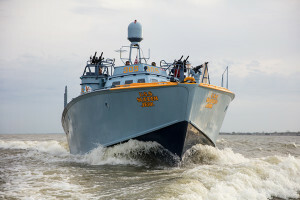 Seventy years ago, on 30 March 1943, the keel was laid for PT-305 at Higgins Industries in New Orleans. Not quite two months later, on 27 May, she was launched. 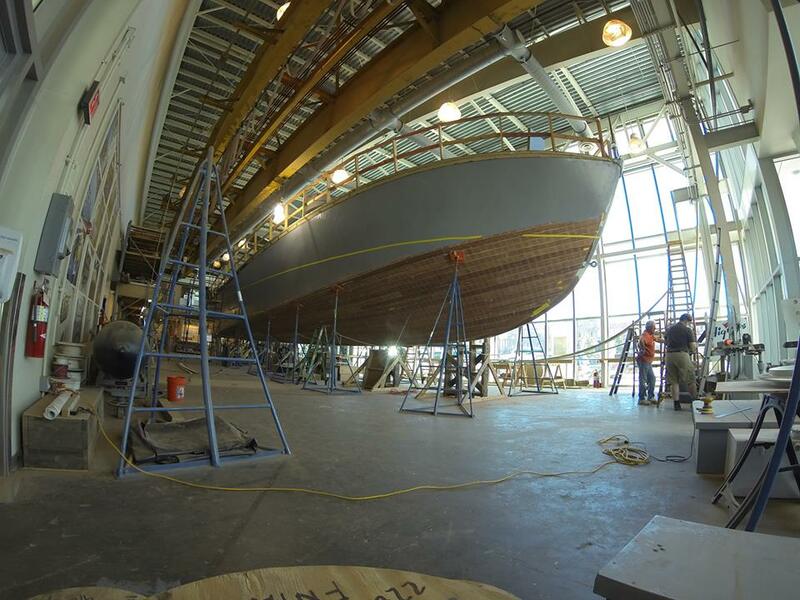 PT-305 is the star attraction in the John E. Kushner Restoration Pavilion where she is the focus of a multi-year restoration project. 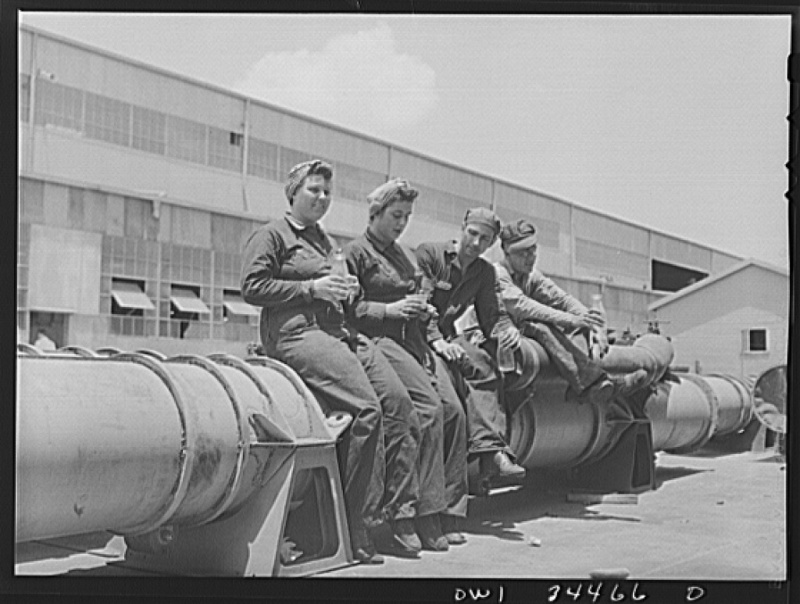 In this Office of War Information photo by John Vachon, Higgins workers eat lunch perched on torpedo tubes. Image courtesy of the Library of Congress. For a period of 66 years PT-305 went without the hands of enlisted US Navy men working on her, but that all changed on a recent Saturday. Throughout the morning, above the normal laughter of the crew and whir of the table saw, was the constant buzzing of random orbit sanders coming from PT-305. The engine room was alive, not with three Packard 4M-2500 engines, but with the hard work of five US Navy volunteers with the ships of NOLA Navy Week. 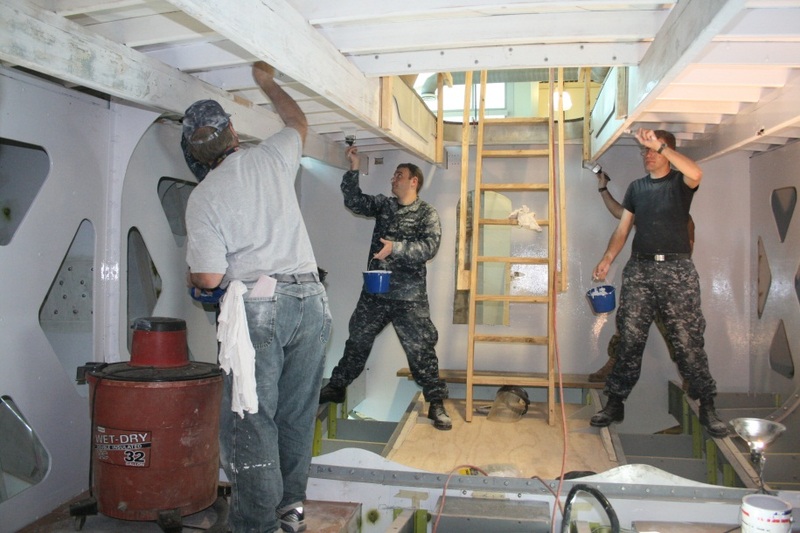 The PT-305 restoration crew is grateful to the US Navy and the eight volunteers who showed up to work, and work they did. Our normal finish paint crew consists of two people, George and Kali. 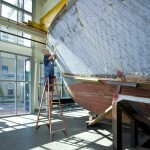 George and Kali have a large task ahead of them, painting the interior of a 78-foot boat with three-inch paint brushes. This task is not out of their capabilities, however, the Navy crew that came in was a tremendous help. The engine room has been a constant focus during the restoration, there are multiple crews coming in and out. The wood butchers were rebuilding bulkheads and stringers, the engine crew was checking for alignment of engine beds with the shaft holes, the structural crew was replacing stiffeners and the electricians were planning routes for conduit. With all this activity, painting has been a complicated task – until the Navy showed up. 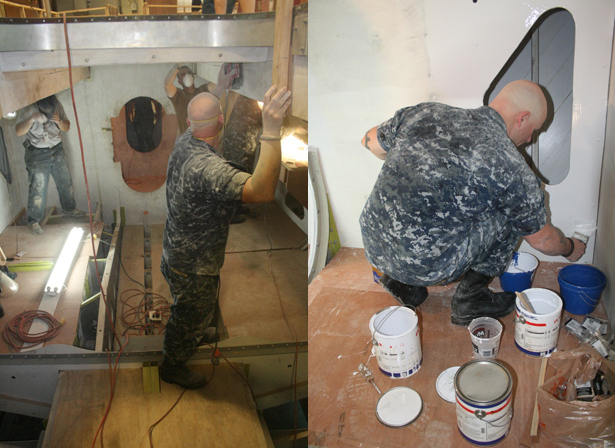 The Navy crew, working with George and Kali, had the entire engine room sanded and painted shortly after lunch. The compartment is now clear for the rest of the crews to return to work. What should have taken weeks was done in a day. 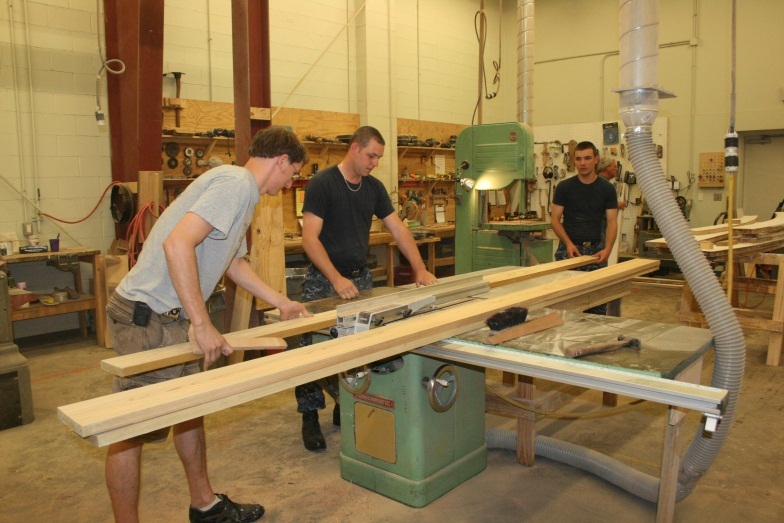 While five of the Navy volunteers sanded and painted, two more helped in the wood shop, working with the bandsaw to cut out hull ribs. Each rib is made as a blank, and then the exact curve and length get drawn onto the blank with the use of a pattern. 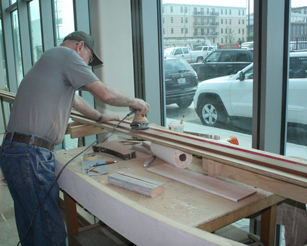 The cutting must be precise so that the rib will fit perfectly into place. 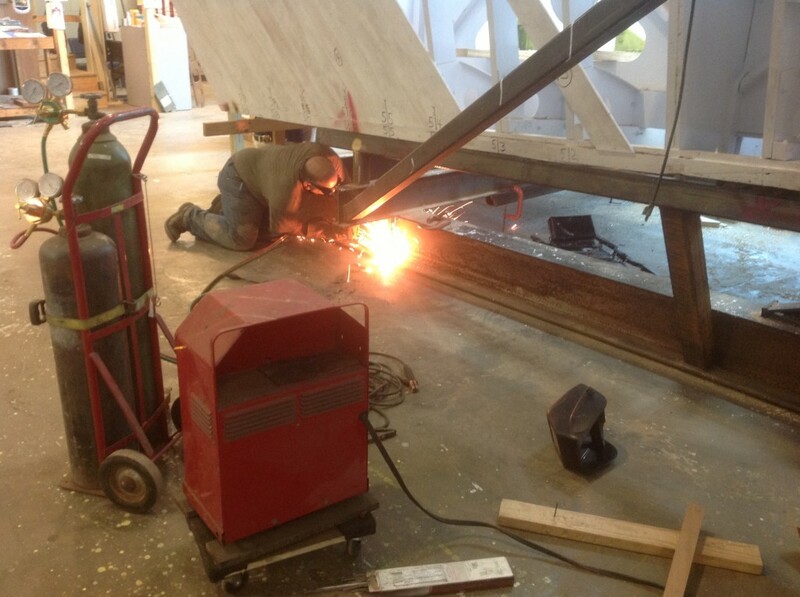 After cutting out some hull ribs, they helped Josh with some deck rib work. Civilian operations continued in the 20mm ammunition locker and at the bow of the boat. Frank and Conrad spent the day working on cheek blocks. 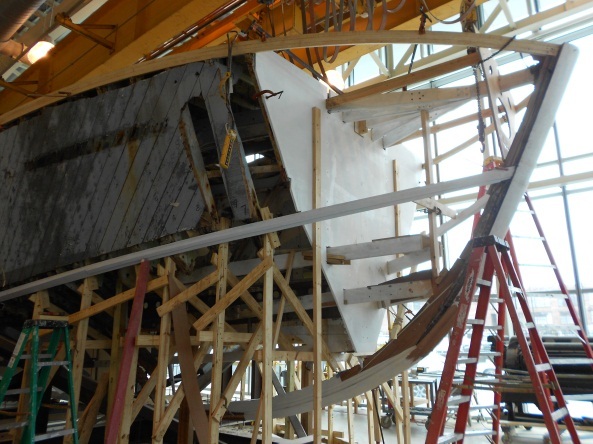 Cheek blocks are attached to the side of the keel between hull ribs. These blocks provide support to the planking where it joins to the keel. The majority of these blocks are a similar shape, making them easy to mass-produce, however, the cheek blocks on the stem are all sorts of shapes. This complicated task has really forced Frank and Conrad to think. 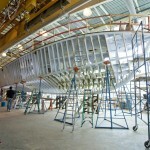 At this point the keel curves up to form the stem and the hull planking comes in at a sharp angle. They have to make blocks that are curved with multiple angles, a task that leaves them frustrated, but enjoying every second of it. Our intrepid trio of Harold, Jim and Ed were busy perfecting work place sarcasm and finishing the ammunition locker. The 20mm ammunition locker sits in the middle of the officer’s quarters and underneath the chart house. The last few weeks have been spent putting in the walls, which run from the deck to the keel: this assembly looks like an elevator shaft. This Saturday, the boys framed and finished the top deck of the ammunition locker, forming the chart house floor. This was done by cutting large strips of mahogany and bolting them to the sides of the ammunition locker. After that was completed, strips of mahogany were placed across the box forming the floor. 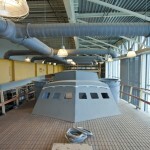 After a ¾ piece of marine plywood was cut to fit the top, the floor was complete. Ed leans into the access hatch for the 20mm ammunition locker, which is located in the middle of the officer’s quarters. 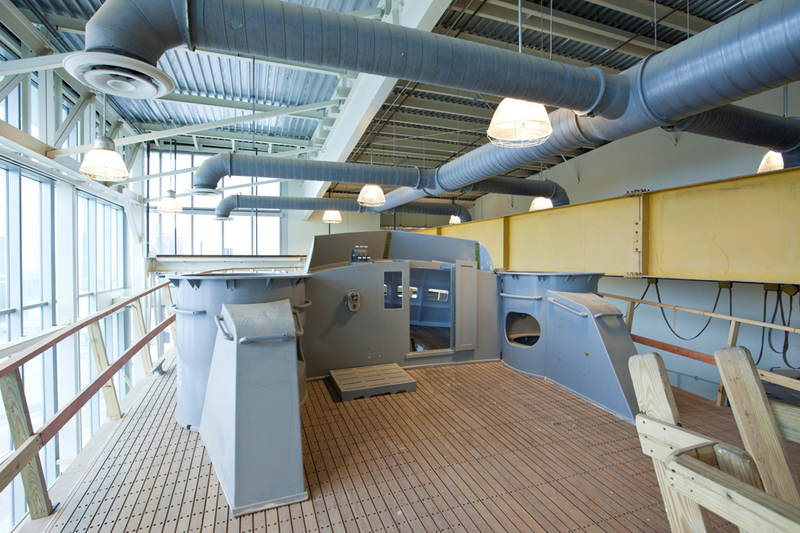 The radio operator’s position in the charthouse is above the 20mm ammunition storage. His equipment sits on the deck, while the operator stands on top of the 20mm storage, putting him at waist height with the deck. Harold (wearing a cap) is standing on a ladder finishing the installation of the charthouse floor. The radio operator would stand just a few feet higher than Harold does here. The gap to Harold’s right will have a ladder leading into the crews quarters, while Ed, at the bottom right, is in the officers’ quarters. 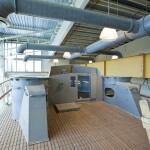 The compartment immediately aft of the officer’s quarters is a fuel compartment. The fuel compartment contains two 800-gallon fuel tanks with the officer’s head between them. 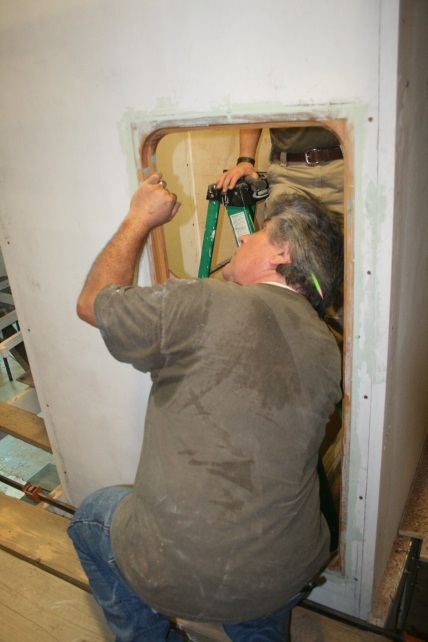 Steering, bilge plumbing, forced air ducts and electricity all pass through this compartment. Because fuel tends to be combustible, each system is run through watertight fittings and kept away from the fuel tanks. The electric lines run through steel piping that keep the lines out of any direct contact with fuel tanks and fuel fumes. There are three of these tubes for each side, making a total of six. 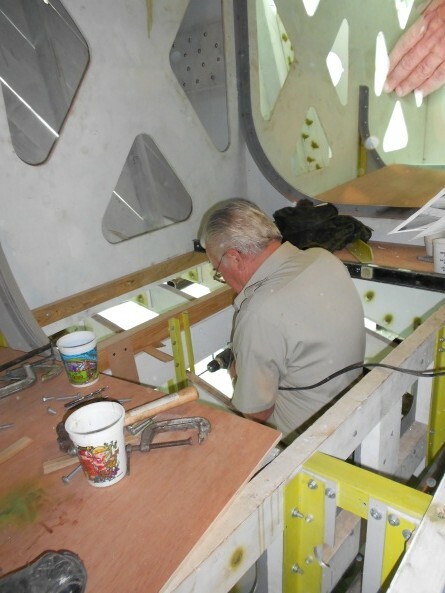 Jim Rivers spent the day working on fitting the pipe conduit to the foreword and aft bulkheads in the foreword fuel compartment. 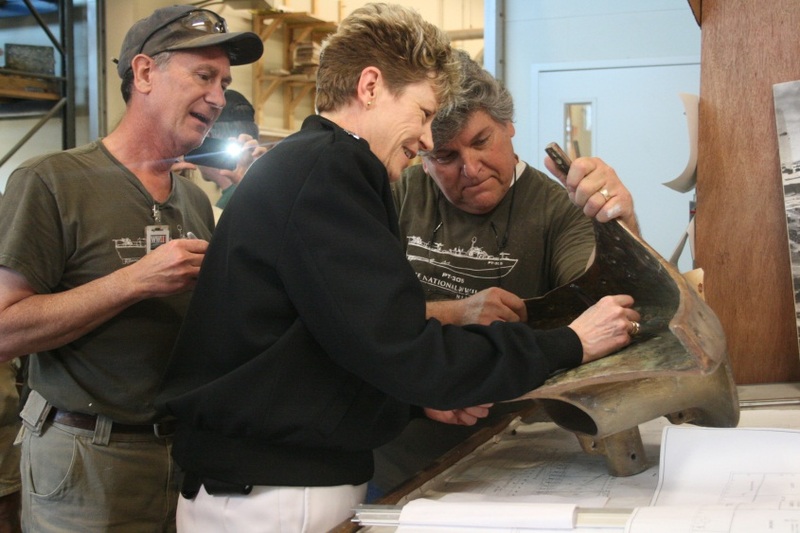 The exciting day for the restoration crew continued when Rear Admiral Ann Claire Phillips visited the Kushner Restoration Pavilion to see PT-305. Rear Admiral Phillips served as the operational commander for NOLA Navy Week. Phillips also serves as the Commander of Expeditionary Strike Group Two out of Norfolk, Virginia, which includes the USS Wasp, one of the ships in New Orleans for Navy Week. After touring the Restoration Pavilion and going aboard the 305, Rear Admiral Phillips, as well as all of the Navy volunteers, signed the underside of the bull nose that is to go on the 305. 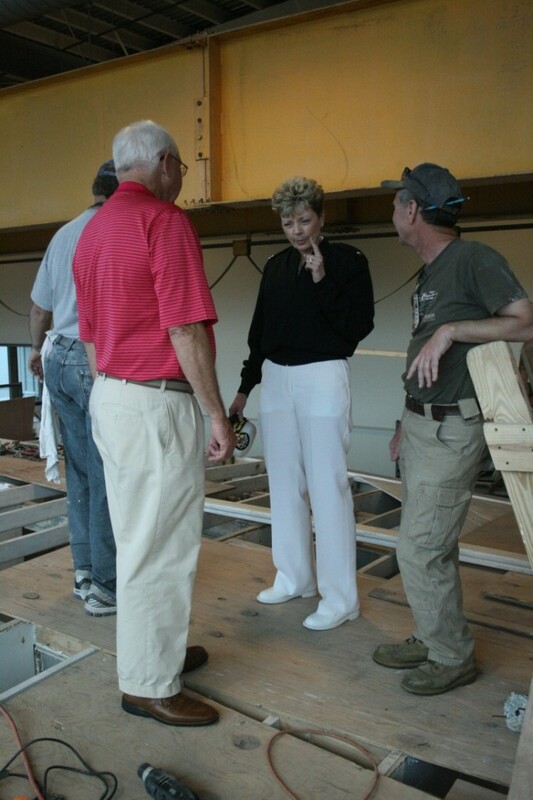 It was a great honor to have Rear Admiral Philips visit and take interest in the restoration project. Rear Admiral Ann Phillips stands on deck with volunteers Harold and George, and the Museum’s President, Dr. Nick Mueller. Rear Admiral Phillips signs the 305’s bull nose. 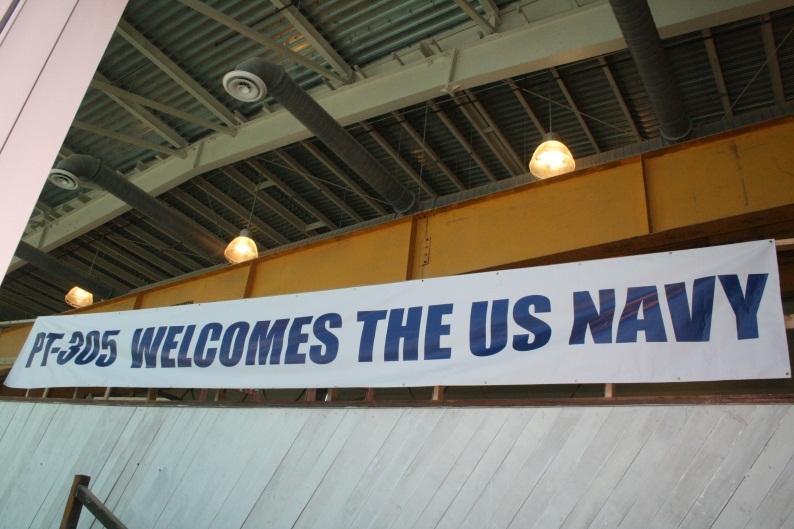 The PT-305 restoration crew would like to greatly thank Rear Admiral Phillips, the Navy volunteers, and all of the service men and women of different nations who came to see the 305. 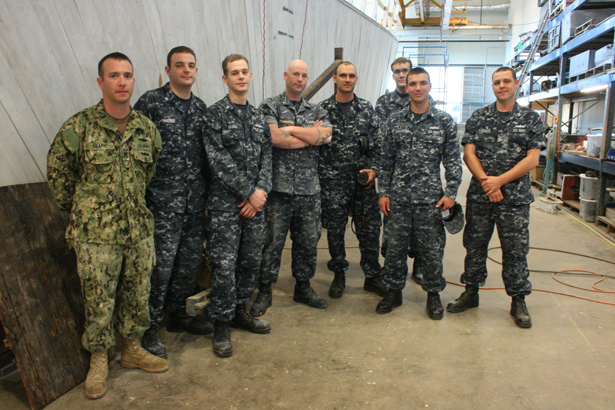 We would like to extend a special thank you to the eight sailors who came and spent the day working with us: Ensign Kenneth Pennington and Petty Officers Michael Wagner, Ken Besso, Russell Poyner, Chris Huddleston, Brian Schuler, Robert Hoffman and Leary. Bravo Zulu to you all! Photos copyright of Jane Swaffield. 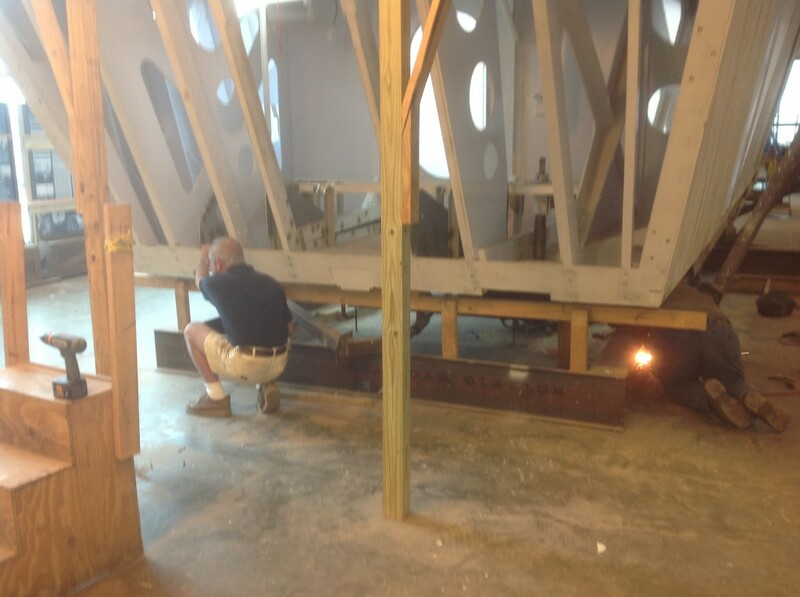 The major goals for the PT-305 restoration crew over the last few weeks have been the fitting and installation of the stem, building the ammunition locker, and the replacement of hull and deck ribs. With the “Wood Butchers” hard at work towards these goals the front section of PT-305, she is on the verge of having all of her hull structure back into place. The stem is the upward curving extension of the keel at the bow, which forms the very front of the 305. This installation brings the keel, sheers and chines all together, which makes it an important structural element in the hull. With the sheers complete, the last few weeks have been spent building and installing the chines. This photo shows the chines and sheers in place. Permanently attached further back, they were only clamped to the stem, until it was permanently put into place. After the stem attachment, the crew permanently attached the chine and sheers to the stem with large bolts. The chine of a boat is the meeting of the side and lower hull. In the case of PT-305 it is a hard chine, meaning there is a sharp angle that defines this intersection. The chine runs the length of PT-305 on the port and starboard sides. Due to the deterioration of the existing chine it was decided replace the foreword 20 feet of the port and starboard chines, splicing it into the original chine. 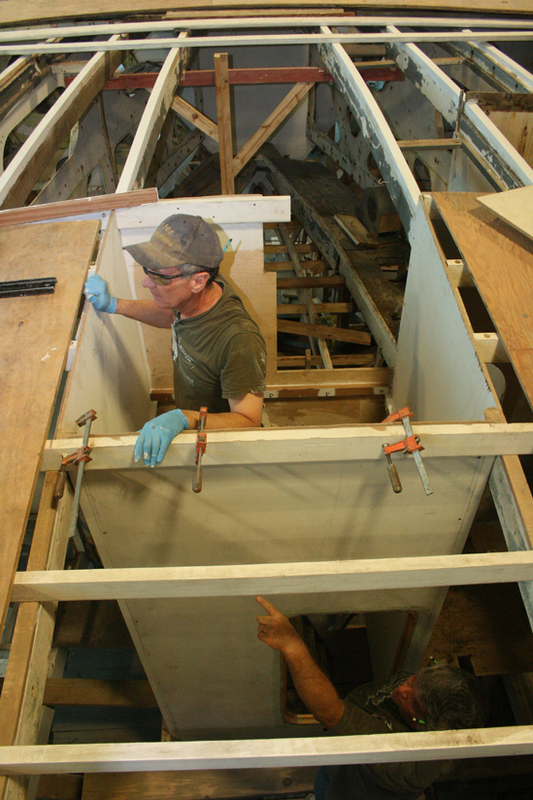 After a few lessons learned in gluing up the sheer, which included splitting apart a 20 foot glued section as the crew tried to attach it to the boat, the process was streamlined, and project coordinator Bruce Harris and volunteer Frank came up with the plan of attack. 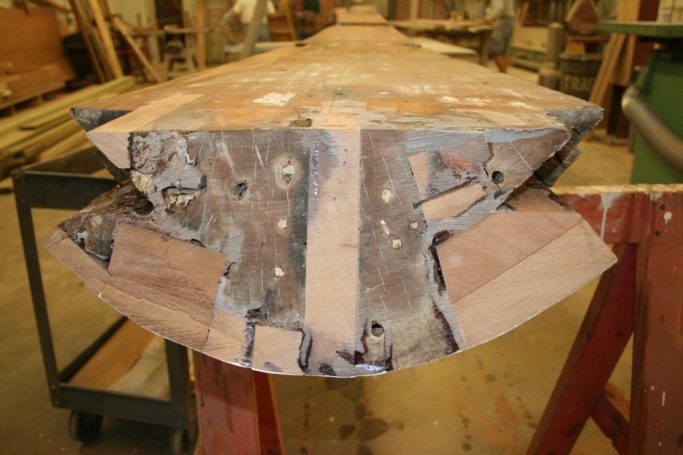 Three boards would be glued together on the boat to get the curve, then they would be removed, shaped and reinstalled as finished pieces. This process took three weeks to complete. After two weekends of glue-ups the chine was removed in order for Bob and Frank to use electric planers to shape it. Once both port and starboard chines were shaped they were installed, clearing the way for the installation of the stem. Weekday volunteer Louis works on clamping a freshly glued piece in place on the starboard chine. The stem consists of three main components, the forefoot, the backing block and the stem. The forefoot is attached to the keel and curves upward, the stem is attached to the forefoot and continues the curve up to the deck, and the backing block secures the forefoot and stem together. When removed from PT-305, all of these structures were too compromised to put back into place, each one would need to be rebuilt. 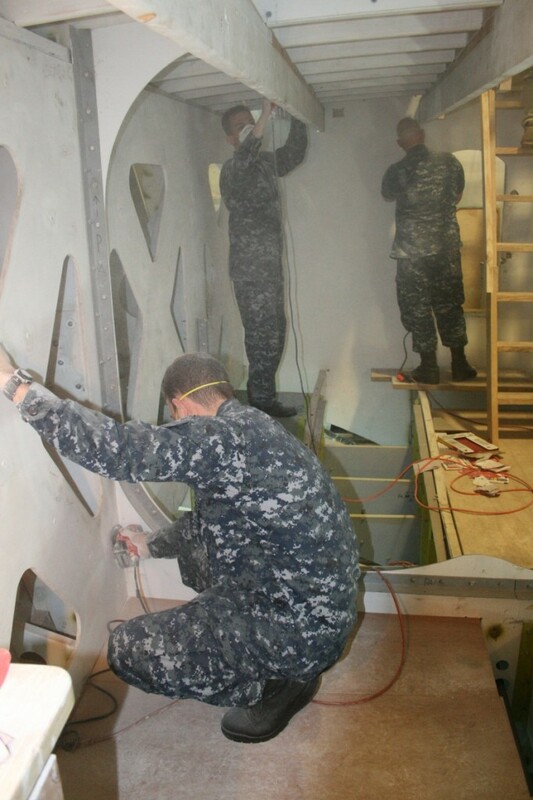 The forefoot and backing block were built by laminating wood from other parts of PT-305. 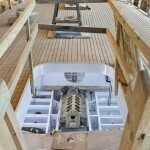 When a part cannot be used in its original location we recycle it by using it to make different piece for the boat. . The crew created the components which make up the stem by gluing multiple layers together to from blocks of wood . These blocks were then shaped into the forefoot and the backing block. 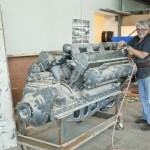 The final piece, the stem, was rescued from PT-659 when she was scrapped. 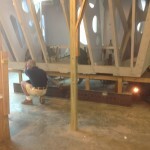 The forefoot and backing block were the first pieces permanently installed. 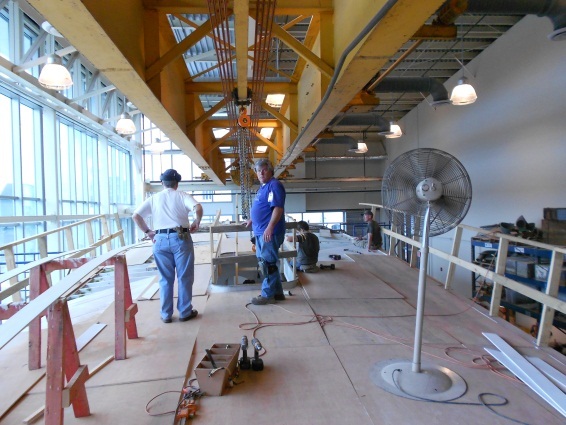 The stem installation could not be done until the chines and sheers were completed. This photo shows the restoration work that can be done by the crew. This is the stem of PT-659, a Higgins WWII original, that has been restored by removing soft, rotten spots of the wood and replacing them with strong, new mahogany pieces. Although backing block and forefoot had been installed permanently for several weeks, the stem had been held in place only temporarily. 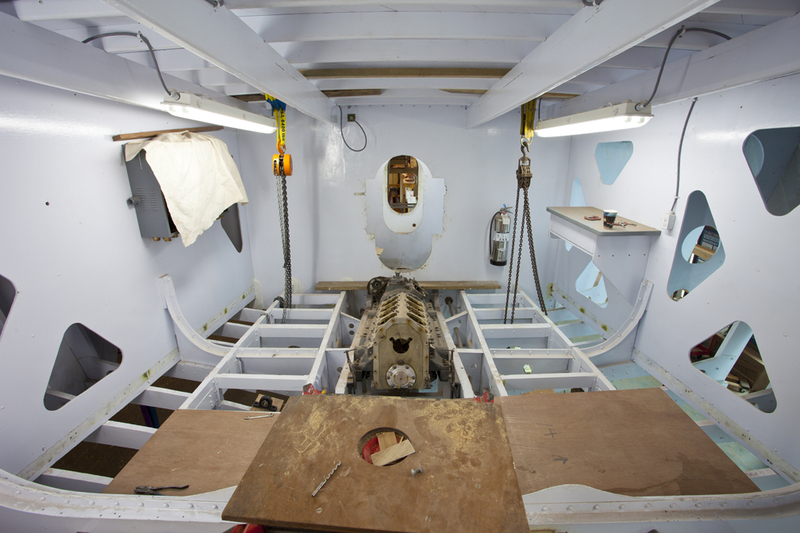 In late March, the crew gathered at the bow of the 305 as Frank’s crew completed the process of permanently attaching the final stem piece. 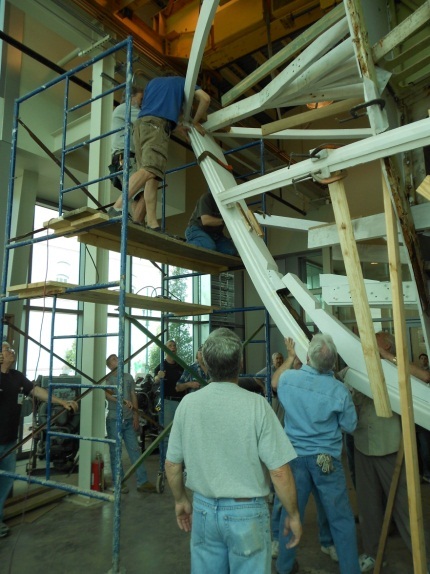 With a few words from Bruce, and wisecracks and laughter from the crew, the large stem was lifted into place. Surfaces were coated in a special flexible epoxy, and as several of the crew strained to get the large piece in place, bolt it to the backing block, and attach the chines and sheers properly, the whole crew looked on, took photos and made even more jokes at the expense of those actually doing the work. Volunteers wrestle the heavy stem into place. 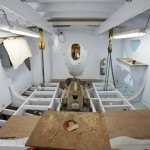 The piece had to be perfectly aligned so that it joined with six other pieces of the boat. 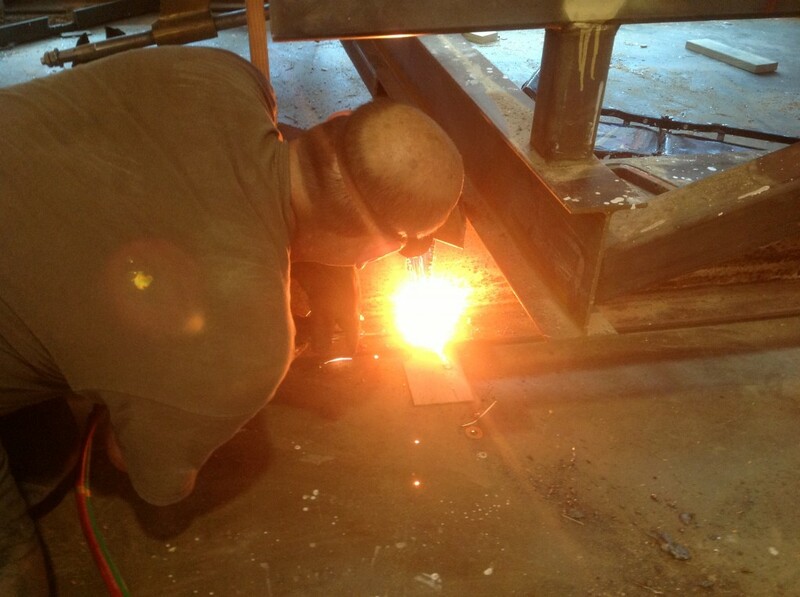 Inside PT-305, Ed’s crew has begun building the ammunition locker. This is where the 20mm and .50 caliber machine gun ammunition is stored. The locker is directly below the chart house and sits in the middle of the officers’ quarters. From the deck it looks like a plywood elevator shaft, and without any shelves installed it is a void from the deck to the keel. The sides of the box are joined by corner pieces with rabbets cut into them to receive the plywood. (A rabbet is a ledge cut into the edge of a piece of wood.) One side of the box is installed already, it’s an original bulkhead that is in place, and the other three sides have been rebuilt, having been removed by PT-305’s previous owners. These sides are 10 feet tall and take some muscle to wrestle into place. After a series of awkward lifts, the three sides have been clamped into place and are awaiting final fastening. 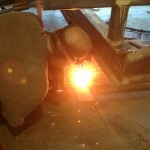 Ed and crew are on the deck while working on the ammunition locker. 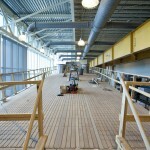 The plywood and handrails on the deck are only temporary, so that volunteers have a surface to walk on while working. 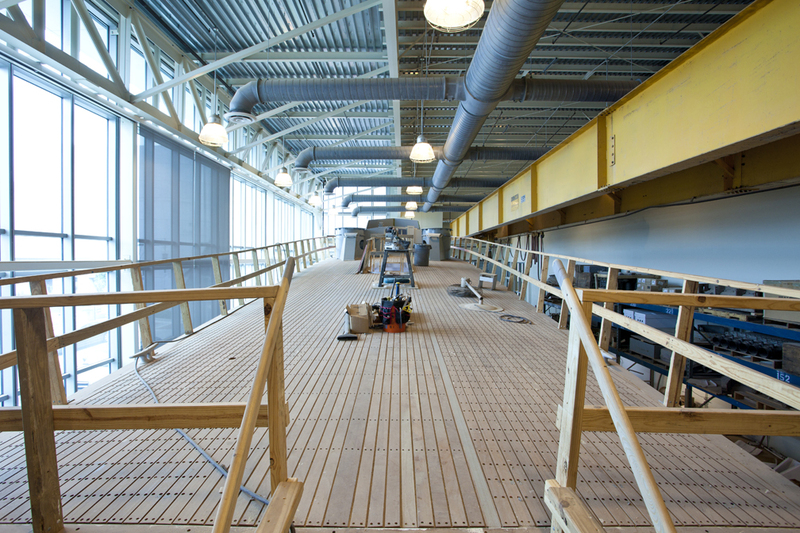 When completed, the deck will be double layered, with a water tight layer in between the layers of wood. The handrails are for the safety of the volunteers. PT boats were not equipped with railings to prevent men from going overboard. 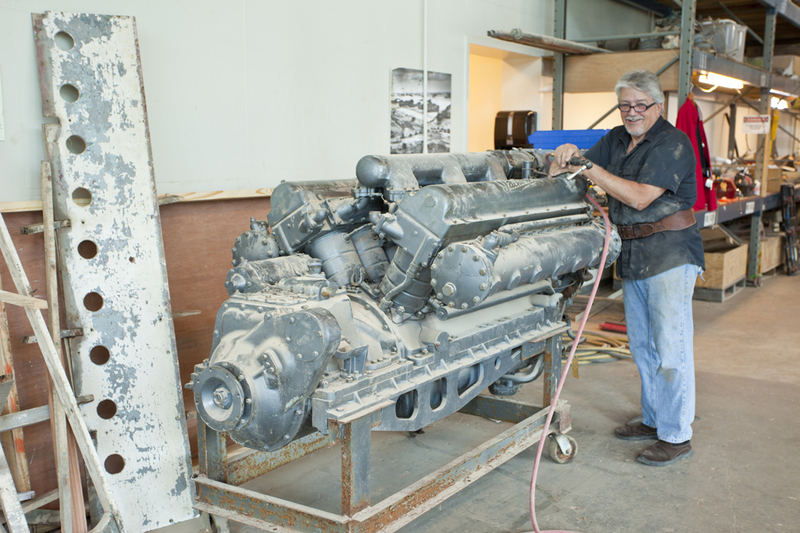 Though the ammunition locker has not been completed, Norman and Jimmy can begin working on the foreword half of the steering system. The steering system runs from the wheelhouse to the lazarette, the last compartment in PT-305. When the wheel which is above deck, is turned, it moves a chain, which turns a pipe. . This pipe runs roughly 60 feet from below the wheel to the steering gear box, just above the rudders. This simple connection of a chain and a pipe to the ship’s wheel turns the two rudders of the 305, thus moving the boat as it maneuvers through the water. At this stage Norman is measuring and plotting the route through the various compartments and bulkheads while Jimmy works on securing and restoring the hardware that supports the system. The engine room crew has been hard at work, installing all of the aluminum brackets and gussets which strengthen the engine room on the 305. 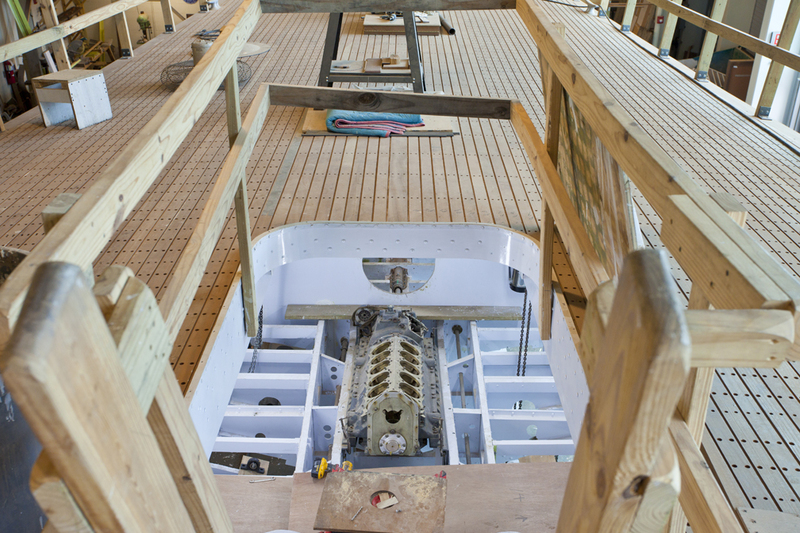 This helps prevent wear and tear on the wooden frame from the boat’s three 3500-pound, 1500 horsepower engines.